Ever searched for yourself on Google and come away dissatisfied, especially if someone else you share a name with seems to dominate the results? Ever looked for someone else and been disappointed that you couldn’t find the person you wanted? Google’s new “Profile Results” launching today aim to correct both problems. 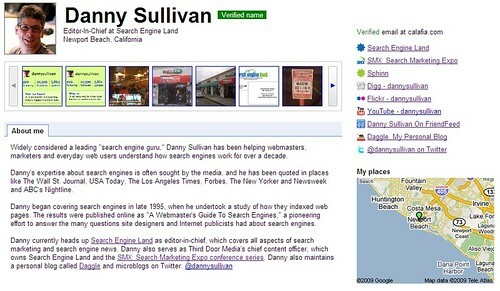 Since the end of 2007, Google has allowed people to create Google Profile pages for use with certain Google services. For example, if you created content in Google Maps, your Google Profile let you share who you were with others using that service. The same profile also served to identify you when using the completely different Google Reader service. Now Google Profiles are going beyond Google’s own services. They’re being promoted as a way for people to tell the world who they are and, to some degree, being offered as a way for people to claim their identity in Google’s main search results. You can also search directly for profiles here. 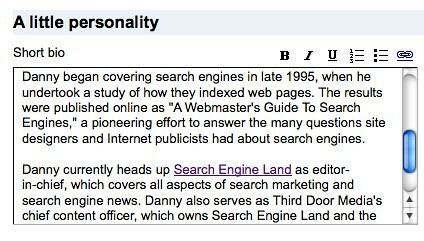 The profiles all come from Google Profile pages, which means in order for a chance to appear, you’ve got to have a page. That’s fairly easy. There’s no charge to have a page, and you needn’t use any particular Google services, either. Just sign-up here. You can also search for “me” on Google, and if you’re signed-in, you’ll see an option promoting how to make your own profile. Not all of these options were offered when Profile pages were first launched. The pages have gained more features over time, and the new additions have been pretty poorly communicated, I’d say. If you’re like me, you’ve probably had a fairly bare display. The new system will cause many people to reexamine their profiles, as they hope to appear in Google’s main results. But with only four spaces, some names will be competitive. Which ones will show? Those that Google feels are “comprehensive enough,” Kraus said. Does that mean you need to fill out all the fields, including what your “superpower” is? No. Kraus said there are no hard-and-fast rules, especially since the system’s ranking criteria are likely to change over time. But for now, those who at least fill out the form with their first and last name (this is the basic requirement), along with a few links to content, will probably increase the odds of appearing. Whatever you put in these boxes will appear. There’s no attempt to verify that you really do have a job title that you claim to hold or that you work for a particular company. However, there is an option for others to report profiles that they feel are inappropriate. For those wondering, so far, these appear to be straight links that do pass PageRank. The nofollow attribute is not used, nor do I see other blocking, so potentially anyone can use their Google profile for link building efforts. I suspect that nofollow will come down the line. You can add any links you like. However, Google will also suggest some for you. Sometimes it can tell from information you’ve entered what links might be related to you, using the Google Social Graph. Or enter your FriendFeed link, and it will suggest other services you’ve told FriendFeed about. As mentioned, you can also add a photo strip to your profile, pulling in pictures from public albums on Google’s Picasa, Yahoo’s Flickr or any URL that provides a photo feed. Just use the Photos tab to do this. Don’t go looking on your profile page for the option on how to verify your name. It’s not there. 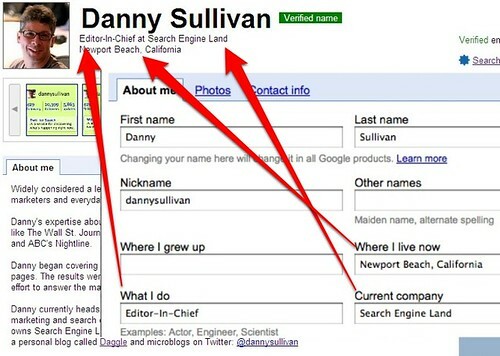 Instead, to have a verified name, you need to enroll in the Google Knol service and verify your name there. If you’ve done that, you get a verified name. If not, you don’t. It’s crazy, but it’s also a symptom of how piecemeal Google’s entire profile system feels to have developed over the past year. It’s as if Google drove its social networking car out onto the racetrack back in 2007 to chase after Facebook but kept adding parts to it during the race, without stopping. Should you get a verified name? Right now, it doesn’t influence whether your profile will rank better in profile results. But if you’re trying to convince people to trust that the page is really controlled by you, it probably makes sense. When people who know you visit your profile and see, for example, your school’s domain name, they’ll be able to know that it’s the real you on your profile. As for those who only have email from a free service, such as Yahoo, Hotmail or even Google’s own Gmail, they’re out of luck. These services aren’t seen as trustworthy enough to allow for verification. While I understand that concern, I also find it odd. If many people start having verified email addresses, then it suggests those who don’t have profiles with verified emails are somehow less trustworthy. And since the entire Profile results system is designed in part to help those with less “net presence,” as Kraus called it, to have a shot of appearing in Google’s results, it’s unfortunate they get discriminated in this way. Of course, as with verified names, verified email addresses don’t mean you’ll rank better. Those unverified folks have just as good of chance of coming up as the verified people. It just from a perception standpoint, they might have profiles that seem less trustworthy. Of course, last week there was a great flurry when it was noted that Google started allowing profiles to have “vanity URLs.” Want a URL that uses your own name? You can have it. Oh joy. If you have a Gmail account, and you claim your vanity URL, then you expose you email address to the world. Google explicitly warns you that this can happen, but it’s still pretty sucky. Why not operate the way that Google’s YouTube does or Yahoo’s Flickr, where you can have a username that is different than your email address? Kraus said that Google is trying to have a unified namespace, where everyone has one name with Google and things are kept as simple as possible. That means using your Gmail name as your profile’s URL. But wait! Life certainly isn’t so simple at Google. I actually have at least two active Google accounts, one of which isn’t linked to Gmail at all. I think I got that one by signing up for AdWords or some other service before Gmail existed. I’m also far from the only person in this situation, given I’ve seen ample Google help pages over time on how to transfer a particular service between different Google accounts. And that non-Gmail account? The good news is that I can use that to get a vanity URL of my choosing. That’s right. Any Google Account not linked with Gmail can set the URL to whatever name they want, assuming that name is free. Of course, this means that if you have an existing account, you’d have to find a way to move some of your services over to the new one (not always easy or even possible). You might also find the name you want isn’t free. And behind the scenes, if you ever do get a Gmail account? Whatever name you picked will be your Gmail address, Kraus said. Clearly I’m grumpy over all this. I wish Google had let people pick whatever names they wanted for their URLs and kept it separate from Gmail addresses. But that’s how things are. Unlike with Facebook, there’s no granular control over what you share with the world on your profile. If you list where you grew up, everyone will see that rather than you selectively deciding to share it with just friends or family. It’s all or nothing. So don’t put anything on your page that you’re not comfortable sharing — which is easy, since nothing other than your first and last name is required to show up in search results. An exception to sharing relates to Contact Info. This is an area where you can list your email addresses, street addresses, phone numbers, IM addresses and your birthday. You can selectively decide which of your friends to share this information with, and you can create groups of friends. How’s all this play out in the Google-Facebook saga? With most of Facebook’s searches being people-oriented, is this Google trying to take on Facebook in the people search space? “We already are a people search engine, in that people search for people all the time on Google, so we’re trying to improve it,” Kraus said. True enough. And the change should be welcomed by many. I’ve regularly gotten email from people wondering how they could show up better for their names, especially in cases where there’s unflattering information about them. Yahoo was recently sued in one case. Personal reputation management is an entirely different issue — but even in those cases, there’s a core of the person wanting to be able to speak for themselves in the search results. The Google Profile results offer a new opportunity for this to happen.